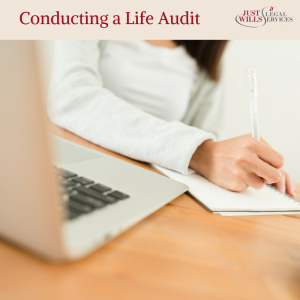 Conducting a Life Audit - How has your life changed in 5 years? Our lives are constantly changing, whether we realise it or not sometimes. In relation to Will writing it is important to ensure that your Will is kept up-to-date with these changes and therefore your wishes are seen through, as you planned, upon your death and beyond. If you asked yourself the following life audit questions comparing how your life was 5 years ago to now, how different would your answers be? Do you own any property? You may have a mortgage but with life assurance in place to pay out for your mortgage upon your death. Do you jointly own a property with someone, are you joint tenants or tenants in common? It can make all the difference to who is entitled to your share of the house upon your death, particularly if you are unmarried. It’s important to have a clear idea of your assets and their values so you can then deal with them in the most tax efficient way. Do you have any debts? If you do then these will be paid by the executor of your Will from your estate after your death as part of the probate process. Only after all debts have been paid can your beneficiaries receive what is remaining. Over time friendships can change, people come in and out of our lives, but how is this relevant to your Will? Well, it may be that you have chosen a trusted friend to be the executor of your Will, or you have left assets to various friends that are no longer in your life. Your health is important, and if you are suffering from ill health then maybe it’s time to look at your estate plan again. Will you need to take money from your estate for your care? And if so what is the best way to do this without depleting everything that you had hoped to pass on in your Will. Another factor to consider is whether you will be able to continue to handle your own finances, and make decisions regarding your future care – do you need to appoint a Power of Attorney? Have you got any new children or grandchildren since writing your Will, or are you expecting any in the next 5 years that you’d like to make provision for? In addition to births you may have acquired step children or step grandchildren, have you thought about how you’d like to treat these in your Will? Unfortunately, it can be the case where there has been a death in the family since writing your Will and this may mean that someone you initially intended to leave something to is no longer alive. If this is the case obviously you can change your Will and gift to someone else, you can also make provisions for this in your Will initially, stating who you would like something to go to in the event of the original beneficiary passing before you do. Have you, or someone that is a beneficiary of your Will, married, re-married or gone through a divorce in the last 5 years? Do you now have step children you would like to benefit in your Will? Whether you already have a Will, are thinking about writing a Will, or even if you aren’t quite sure if you even need one, why not complete our handy questionnaire below to help you conduct your own life audit. Do you own the same amount of properties? If these have increased perhaps you would like to bequeath these to different beneficiaries. Is your Life Insurance still in place to cover the outstanding mortgage in the event of your death? What is the current market value of your home / properties? Have you amassed more personal assets i.e bank and investment accounts, pension funds and personal property of value such as artwork, musical instruments and antiques since your last Will? NOTE: remember your estate could be penalised by IHT if it comprises assets worth over £325,000 – Check out our IHT tax guide to learn more. Have your debts increased since your last Will? Include credit cards, mortgages, equity loans, car loans, student loans, personal debts or other bills? NOTE: If you are unlikely to have enough cash in your accounts to cover these debts at the time of your death then you will also need to decide which assets you would like your executor to sell first to cover your debts. Do you have any debts owed to you? List who from, how much for and whether you would like these debts to still be collected after your death. Who is named as executor of your Will? Are you in good health? – Have you been diagnosed with something unforeseen since you made your last Will? Have you had any more Children or Grandchildren? Do you have any step-children or step-grandchildren? Do you plan to provide for them in your Will? Have there been any deaths among your beneficiaries? Is your marital status still the same? Have any of your beneficiaries gotten married, divorced or going through a divorce? – This could impact on who you see your bequest going to. And finally, do you still remember where your existing Will is and do the relevant people know where it is for when they will need to find it.